I was feeling sentimental and sappy this morning, so I was looking through old photos. Do you ever do that? This picture is of me and Corey over six years ago. 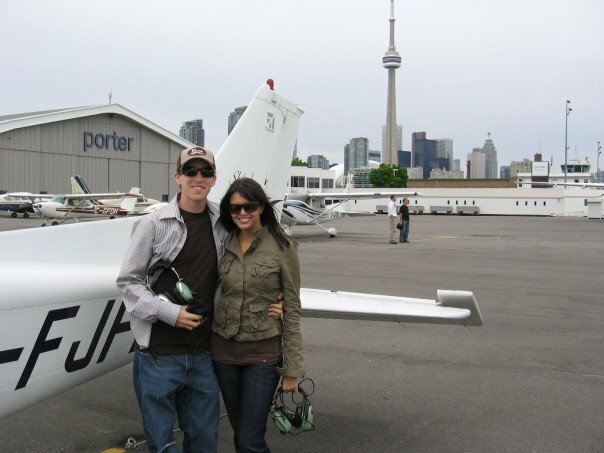 I had bought him the gift of a flying lesson and I splurged on a lesson in a larger plane, so that I could ride in the back and share the experience with him. How fun is this picture of "young" Corey and Taylor? What's that? He's still young? That's mean! :P This also makes me recall that brief time between university and real life when you could just blow your money on frivolous things without feeling irresponsible or guilty. Good times! Is there anything you spent money on back then that makes you laugh (or shudder) now? Me too! It's Friday the 13th... do you feel unlucky? Personally, I feel the opposite after a very rewarding (yet busy) work week! After feeling very empowered in a recent professional course, I almost want to challenge the "bad luck" stigma of the day by doing something outside my comfort zone. We all have things we could be doing (perhaps even want to do...) but don't because they're scary or uncomfortable. Perhaps it's making amends with an old friend... Or apologizing to someone... Or speaking in public... Or letting something go. Anyway, I'm going to do something squirm-worthy today. Care to join me? I loved this story. This is why it's so important to keep your eyes open. I thought this short film was very well done. What does the social media age mean for privacy and trust in relationships? I suppose today is more of a "Friday Watching" day, since I have yet another video. I thought this was sweet! As a women, I know that I use the phrase "I feel like" far more than I should. Here's why I would like to stop. Did you love the show Friends? I remember that in my second year of university I was a frosh leader (this was back in 2001) and we made a Friends parody video (with the clapping and the outdoor couch... and (unfortunately) the dancing in the fountain) and people made me play Monica because we share some character traits. I think this show was on while I was in high school but I remember loving it. Now I look back and see that the characters were my age and didn't seem to have real jobs and often had unrealistic incomes aaannnnddd.... the house of cards comes crashing down. Still, I can enjoy it for moments like these. I love this easy grammar trick and have been using a variation of it for years. It's nice to see it properly explained. Okay, that's all for now. Do you have something special planned for the weekend? Make it a great one!